Midnight has passed. You're almost to your carriage when one of those pesky glass slippers slips right off your foot. You trip, and then wince at the clink of something delicate shattering as you tumble down the last step leading away from the castle. "Are you all right?" It's a gentleman's voice. You roll over - as gracefully as possible - and glance up at your dancing partner. Once again, he holds a hand out to you; it's an invitation. You place your hand in his, but before he can help you onto your feet, you glance at the shards of broken glass. It seems to be all that you can see, the lights from the windows reflecting off those little pieces. He follows your look. "I'm sorry about your shoe." To your surprise, there's a hint of laughter in his tone. "You know, I really don't care." You smile up at him. "When else would I have the chance to wear such things?" As he raises you effortlessly, he declares, "Why, at another ball, of course." Your eyebrow lifts slightly. "I don't get invited to many balls." You realize there must surely be a tale there. You're about to ask him more about it, when he kisses your cheek and whispers near your ear, "I'll get you five more glass slippers, and we'll invite ourselves to as many balls as we can find." Before you all hop into your carriages, we never did get a chance to share about our own dresses and favorite dance songs, did we? Here's a dress (discovered via Pinterest) that I think is simply beautiful! Tell me, what have you been wearing to the ball this week? Which song are you hoping to hear before the orchestra leaves? Ah, yes - we haven't forgotten! It's time to announce the winner of the "Cinderella of the Ball" giveaway! The winner receives all of the following prizes: a paperback copy of Five Glass Slippers, several Cinderella-themed items (including a bookmark crafted by Belle on a Budget, a journal, and a DVD copy of the Disney movie), as well as special gifts handpicked by a few of the collection’s authors (a glass slipper cookie cutter with recipe, freeze-dried astronaut ice cream, and an Apple Tree Inn cup and saucer). But hurry! The sale ends at midnight (or thereabouts). Fitting, no? You can also buy the book in paperback. And as you can see by all the positive reviews rolling in, this is a book you'll definitely want to have on your real or virtual bookshelf! As you enjoy a last glass of punch and a final song, let me take a moment to say "thank you" to all of the amazing bloggers who participated in the tour this week! Seriously, I sent them a lot of information, and there were a lot of tidbits and dates to keep track of - yet things came together quite smoothly! Everyone's enthusiasm and attention to detail made this a tour to remember, and I'm so grateful for the effort and time the bloggers put in to make this happen. This concludes the Five Glass Slippers blog event, but let's continue to celebrate life's Cinderella moments and dance the night away! 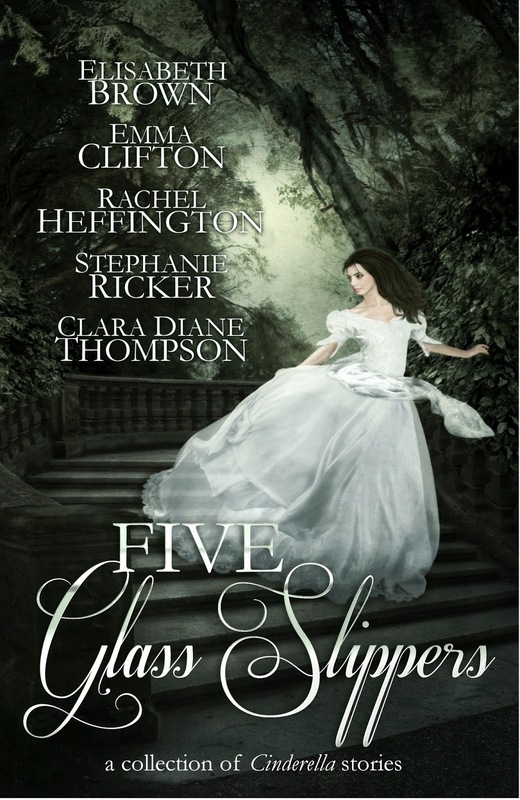 And the Five Glass Slippers blog tour continues! (The home page/entrance hall can be found HERE.) We're celebrating the release of this special Cinderella-themed anthology (published by Rooglewood Press) by featuring each of the collection's five authors as "Cinderella of the Day." You'll find out which dress they're wearing to the ball, what dance song they've requested, and you'll hear about their very own Cinderella moment - in addition to discovering some fabulous fun facts via the interviews on participating blogs. 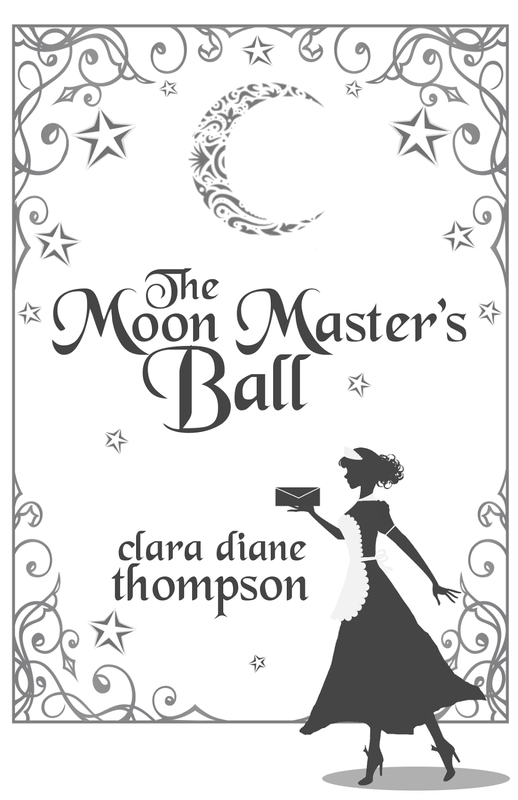 Today's "Cinderella of the Day" is Clara Diane Thompson, author of "The Moon Master's Ball"! Amber: Our final guest has arrived, and doesn't she look gorgeous? Tell us about that lovely dress you're wearing, Clara. 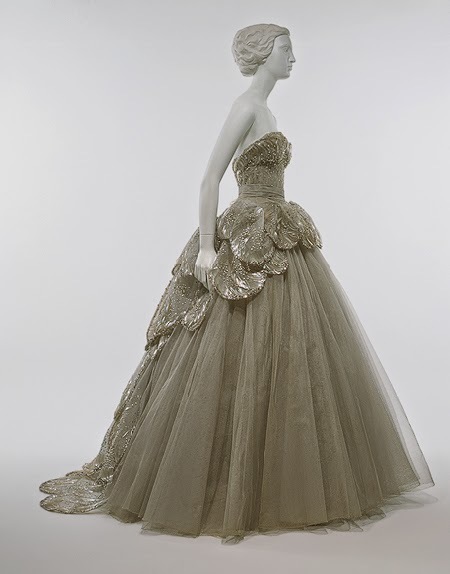 Clara: The dress is a Christian Dior design called "Venus". Amber: Beautiful! And what sort of song would you want to dance to while wearing such a dress? Tell us, what was your Cinderella moment? Clara: Few things in my life can be counted as a “Cinderella” experience. I’ve never been to a ball, I don’t have a pair of glass slippers, and I have yet to meet my Prince Charming. But, thankfully, there are more comparisons to draw between my life and Cinderella. The heroine of the classic fairy tale went through trials and dark times, but her life turned out to be all the brighter for them! She had two evil stepsisters who made her life miserable. 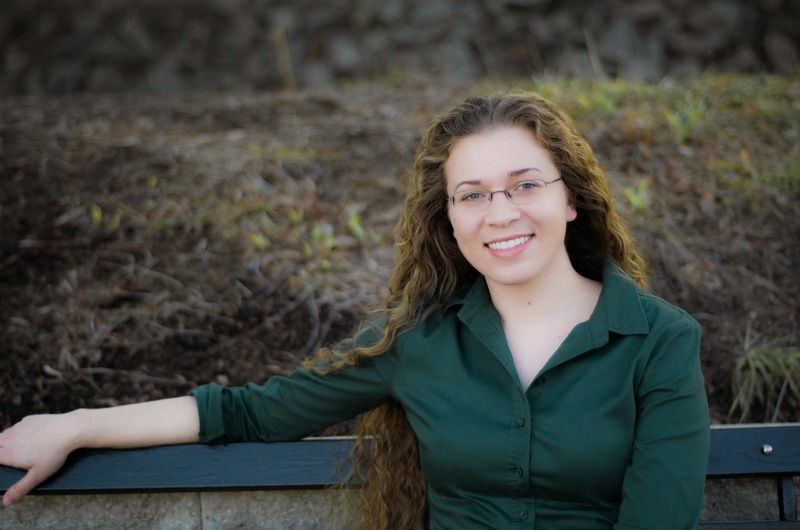 Her father died…everything about her life seemed simply undeserved! This reminds me of that cheerless time in my own life when the doctors discovered that my big brother had cancer. I was nine when he was diagnosed, and didn’t quite understand what was happening. All I knew was that my brother was in the hospital, and my Mom was staying with him…oh, did I miss them terribly! It was certainly a dark time in my life. It felt wrong…unjust even, that leukemia had snared my brother. Through his hard journey with leukemia, he was able to share his faith with so many doctors and nurses. Plus, it inspired him to become a nurse himself once he was declared cancer free! He’s still free of that horrible disease after these ten years, and is still a wonderful big brother whom I love very much! So, like Cinderella, there was one massive, black time I had to overcome, and like Cinderella, I am now living happily ever after. Amber: You know, I think what really makes a "Cinderella moment" is the attitude. Cinderella lived a hard life before (and even after, for a time) the ball, but she was a kind person with a beautiful heart full of hope. That sounds just like you and your family, Clara, and I'm so thrilled to hear you're living in a real-life happily ever after! Do you want a chance to be Cinderella of the ball, as well? Today is the LAST day to enter the tour-wide giveaway! 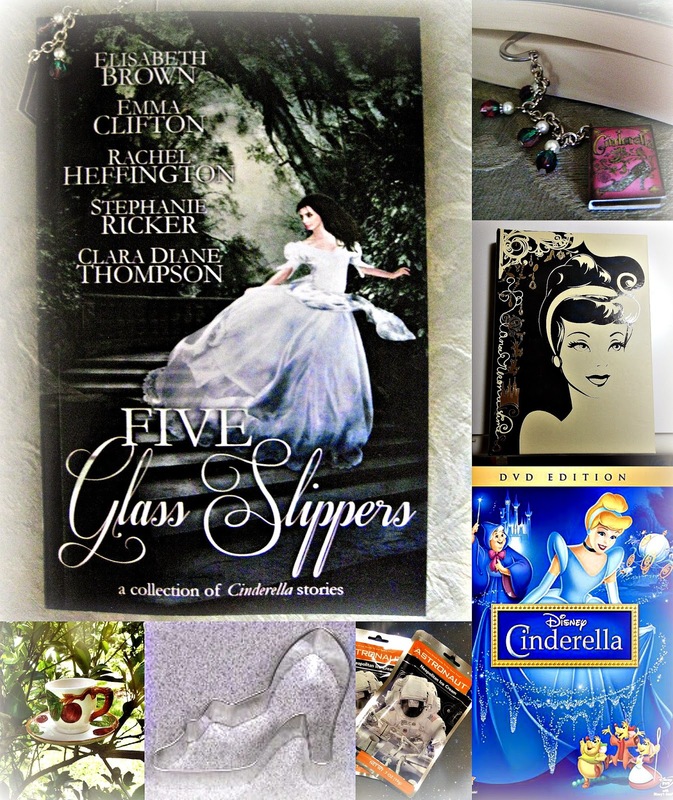 One lucky winner will receive a paperback copy of Five Glass Slippers, several Cinderella-themed items (including a bookmark crafted by Belle on a Budget, a journal, and a DVD copy of the Disney movie), as well as special gifts handpicked by a few of the collection’s authors (a glass slipper cookie cutter with recipe, freeze-dried astronaut ice cream, and an Apple Tree Inn cup and saucer). This giveaway is open to residents of the U.S. and Canada only. 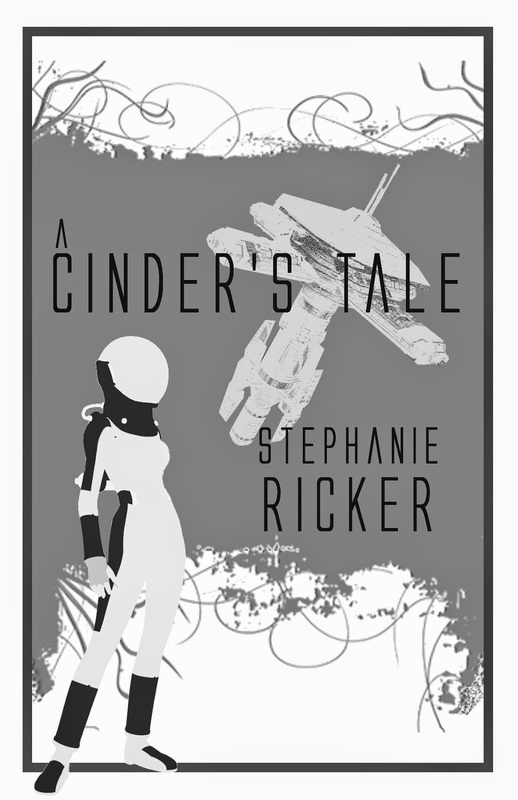 Today's "Cinderella of the Day" is Stephanie Ricker, author of "A Cinder's Tale"! Amber: OK, that is just plain awesome. 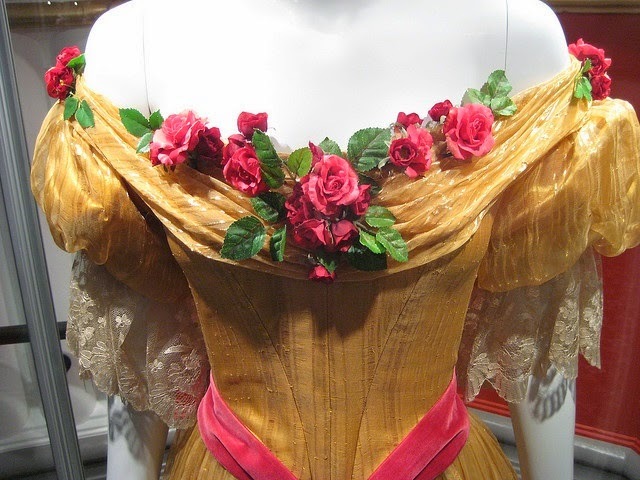 I could picture your heroine, Elsa, wearing something like this - perhaps with additional space gear! Which song are you hoping the orchestra plays tonight? 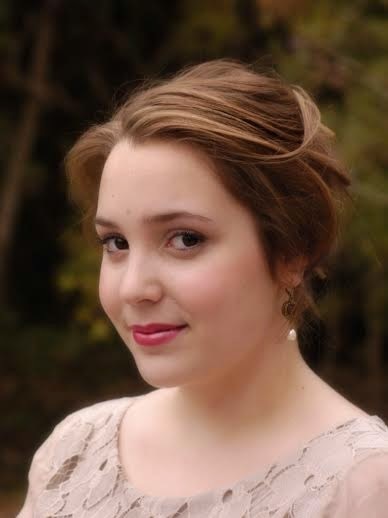 Stephanie: I love swing dancing, so I must choose “Sing Sing Sing” by Benny Goodman. Amber: Yay! Swing dancing! I'm not an expert at it by any means, but I, too, love what little I know. :) So fun! Can you share your Cinderella moment with us before hopping onto the dance floor? Stephanie: My Cinderella moment happened about five years ago. I graduated from college during the recession, and job offers were mighty scarce. I took a job in Florida, which I thought was ebook editing (turned out not to be) and which I thought would be decently paying (turned out not to be). I had left all of my friends and family in North Carolina, and I didn’t know a soul in the entire state. I was so broke that I would scour parking lots for change, use the coins to buy an hour’s worth of metered parking at the beach, and gather coconuts on the beach to take home and eat. I was miserable. After four and a half months, I finally caved and moved back to North Carolina, even though I didn’t have a job lined up on the other end. On the day after I moved back, I interviewed for an actual editing job that paid actual money…and I got it! Overnight I went from a job I loathed, existing mainly on rice and coconuts and desperately missing everyone I cared about, to a job that used my degree, was close to loved ones, and provided a paycheck that seemed positively luxurious by comparison. It was a huge blessing from God, and I’m so grateful to be where I am! Do you want a chance to be Cinderella of the ball, as well? All this week (through Friday) you have a chance to enter the tour-wide giveaway! One lucky winner will receive a paperback copy of Five Glass Slippers, several Cinderella-themed items (including a bookmark crafted by Belle on a Budget, a journal, and a DVD copy of the Disney movie), as well as special gifts handpicked by a few of the collection’s authors (a glass slipper cookie cutter with recipe, freeze-dried astronaut ice cream, and an Apple Tree Inn cup and saucer). This giveaway is open to residents of the U.S. and Canada only. 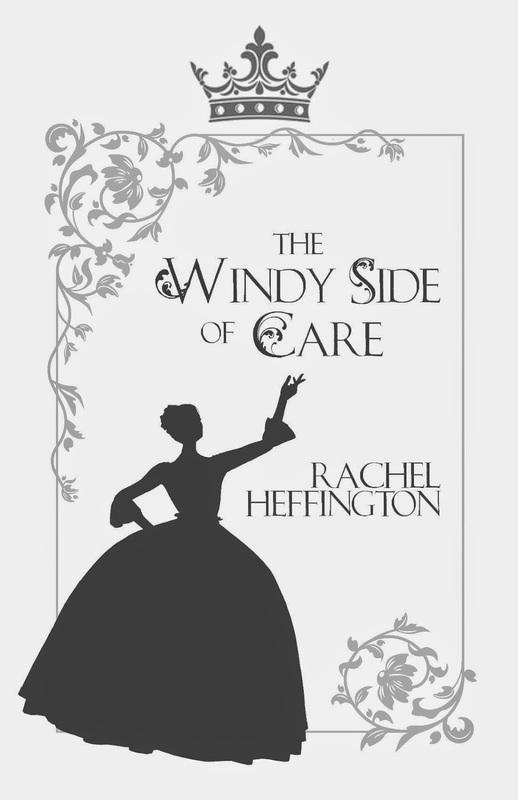 Today's "Cinderella of the Day" is Rachel Heffington, author of "The Windy Side of Care"! Amber: Why, with those roses, it could also work for a ball in celebration of the next collection (Five Enchanted Roses). :) Very nice! Which song are you hoping to dance to tonight? Amber: Oooh, I love this song! I seriously wanted them to play this at my own prom. :) No such luck, but still... At least we get to enjoy it at this ball, right? Do you have a Cinderella moment you can share with us before some handsome bloke sweeps you away? Rachel: It came after a week of counseling at a summer camp high up in Colorado. I was tired to bits with losing my breath just crossing the green, but it was the gala night and I would try to set aside thoughts of all the problems attending a camp full of high-schooler students. I slipped into my blue and black taffeta cocktail dress, slid my feet into my black heels and tossed on earrings and a bit more mascara. It would have to do. There was a mountain lodge to transform into a Hispanic fiesta hall. Slowly, hoping not to arrive a panting mess, I crossed back to the lodge and entered through the side door. A few of my fellow counselors looked me over appreciatively and the girls congratulated my transformation. One of the staff, a man I did not know in the slightest and who had only stared at my panting, t-shirt-clad self before, struck up conversation and kept it up for a full ten minutes. It was innocent and gratifying, to be noticed. The campers poured in, all in their finery; the music began and I slipped easily into my given role, far more charming and witty than I'd felt before. I can do this, I thought. I've left the t-shirts behind. 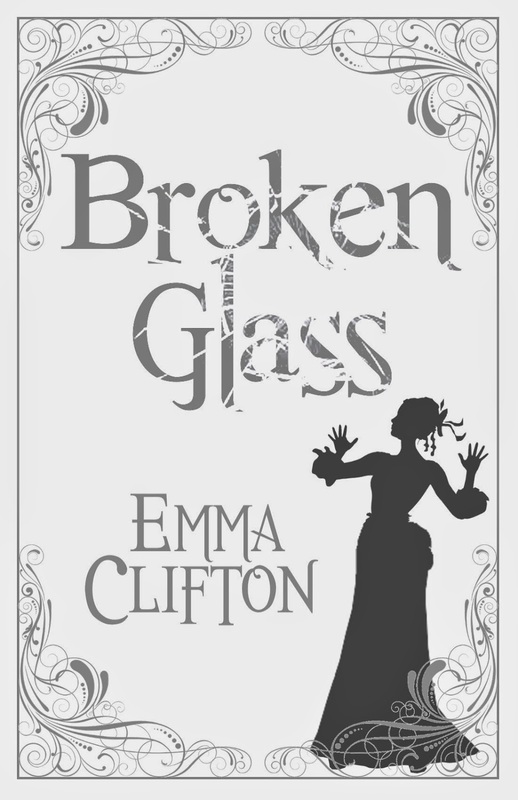 Today's "Cinderella of the Day" is Emma Clifton, author of "Broken Glass"! Amber: Our next guest has arrived! Wonderful to see you here, Emma. 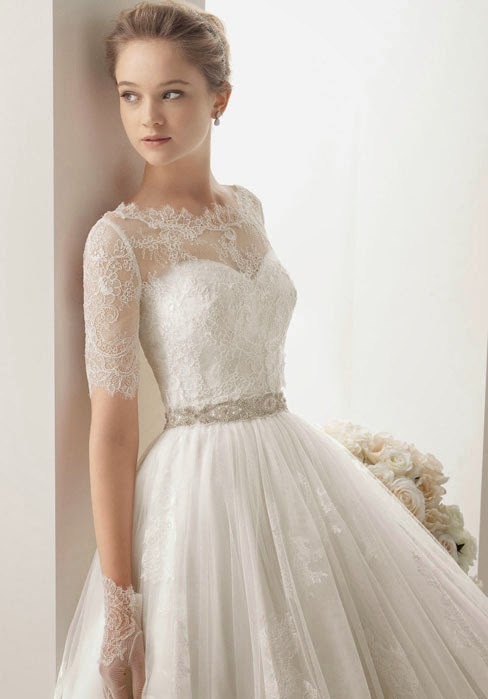 Give us a twirl and let's see your lovely dress! Amber: Well, this is fabulous! I love the simplicity with a bit of flair, and the color is very pretty. You look beautiful, Emma! Amber: Haha, too fun! Disney is appropriate for any occasion, right? I don't think I would have thought of this one, but it really is a "get up and dance" song, isn't it? Could you share your Cinderella moment with us before you get back to dancing? 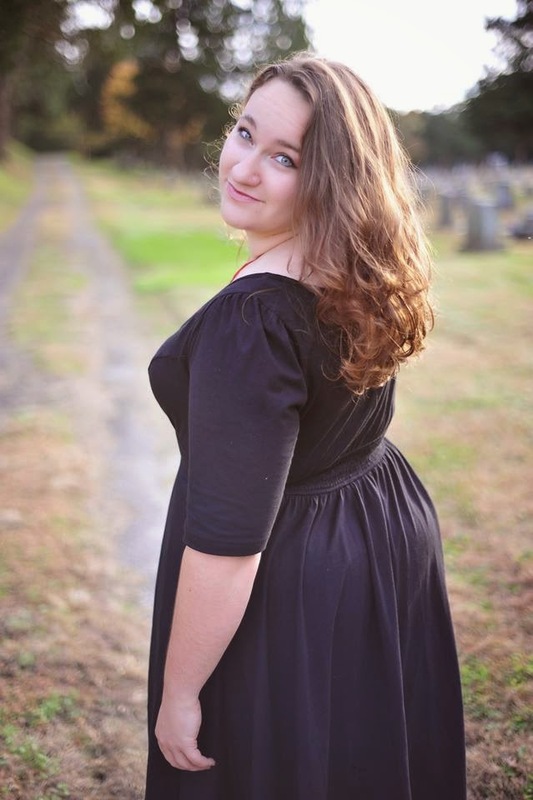 Emma: Recently, a young lady at my church was cleaning out her closet, so she invited all of the girls to come over and take what clothes they wanted. My sister and I went over and I didn't expect to find much. I was totally surprised! This young lady had a bunch of gorgeous dresses and a lot of them fit me perfectly! I was so happy and felt rather like Cinderella. Getting so many lovely dresses for free--it really made my day. Amber: Aww, that's awesome! An unexpected gift. Who doesn't love getting new dresses? And no price tag - even better! It's early evening, and the ball is about to begin. A footman opens the door of your carriage, extends a hand to help you down the steps. The chandelier and candles in the ballroom are shining through the windows of the castle, beckoning you onward. You glance down at your dress. Perform a little twirl and smile a little smile just for the sheer joy of the moment. The faint strains of music drift through the air, and you skip-walk until you merge with the crowd. Available now in paperback and Kindle formats! Today's "Cinderella of the Day" is Elisabeth Brown, author of "What Eyes Can See"! Elisabeth Brown has always loved words. 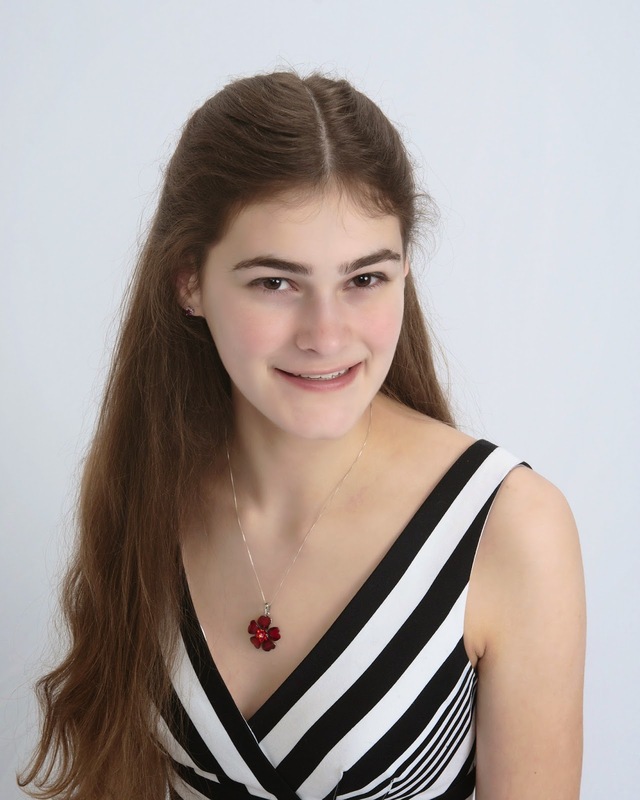 The third of seven children, she enjoyed being homeschooled through her senior year of high school, and is now studying piano performance at Appalachian Bible College. When she’s ignoring the fact that she should probably be practicing more or doing Greek homework, you’ll find her sewing, baking, reading, singing along to basically any musical ever created, hiking through the woods, or laughing at incredibly silly puns. What Eyes Can See is her first published story, but she also rambles at www.metaphoricalcello.wordpress.com. In Elisabeth's words: It's purple. It's poofy, but not too poofy. It's sparkly, but not too sparkly. It's basically perfect. Amber: I am in complete agreement! Purple is my favorite color, so I'm loving this dress. So which dance tune are you hoping to hear tonight? Elisabeth: "The Laendler" from The Sound of Music. Amber: Lovely! Perfect for a ball. :) Makes you want to hum along. Now, before you enter the castle and start dancing, could you share a "Cinderella moment" with us? Elisabeth: I've never faced an authentic Cinderella moment when I suddenly went from scullery maid to princess, mainly because I've never been a scullery maid. I have felt like a princess, though; one relatively recent time when I was particularly blessed was last January. I was in the piano lab at my school, doing ear training drills, which are, for me at least, quite challenging, sometimes even tear-inducing. Anyhow, I was sitting there, drilling away, when a friend texted me: I'm ready for a break from homework. Do you want to join me in the Servant Center? (The Servant Center is, gentle readers, the location of my school's student lounge.) Tired of ear training, I eagerly acquiesced to her suggestion. We wandered over to the Servant Center, when she paused before a classroom door. "I wonder what's going on in here?" she remarked innocently. "Kaite," I replied suspiciously. "Why are you going into a dark and empty room?" Katie merely returned "Why not?" with her most angelic face. So we walked in, and immediately were greeted with calls of "Happy birthday!!" ... just for me. My friends had gone out of their way to throw me my very-first-ever surprise birthday party (complete with purple cake! ), and I couldn't have felt more blessed. From ear training to cake-eating...I'd say that's a Cinderella moment if ever there were one! Amber: Indeed! How special. Purple cake and a surprise from friends - doesn't get much better than that! And the samples sold me, to the point where I bought two of the songs from the EP (extended play). I've listened to the samples over and over again, relishing in the sweetness and variety of sounds. So finally, I ended up buying Young North (another EP), and the other day I completed this EP (Woodland) and purchased a song from their full debut album, States. 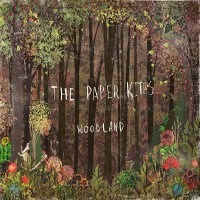 I'm not exactly sure how to classify The Paper Kites' music. I'm not sure they even want to label themselves, as their Facebook simply notes in the bio section, "Hello, we're The Paper Kites, we play songs." Well, it doesn't get much simpler and unclassifiable than that. ;) But Amazon goes with Folk and Singer-Songwriter, and I'm cool with that genre association. I currently have "Bloom" on my Morning Glory soundtrack page, as I just love the sound and theme for the hopeful thread of my WIP. 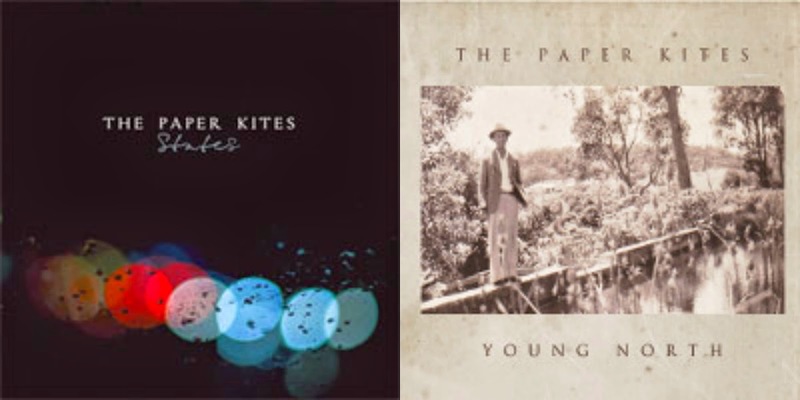 Have you heard of The Paper Kites? What do you think of this type of music? What are your thoughts on music videos? To be honest, as much as I love dissecting themes in stories and poems, music videos often seem to stretch beyond any connections I ever would make... The last two above, especially, are not exactly what I picture when I hear the lyrics. ;) Even still, the music videos are like an art form in their own right, and as a separate creation, I'm rather enchanted. I've been making repeat trips to Austenland lately. When I first rented it and watched it on my laptop, I confess I wasn't overly impressed, mostly because the innuendos and whatnot stood out like stains on the carpet of a new apartment as I was first immersing myself in the world. But when I spotted the movie in Target, the humor and strange sweetness came to mind, and I later made it one of my purchases with an Amazon gift card. Since then, I've re-watched the movie several times. Yes, the crude moments are still there...but they serve as an emphasis for the ridiculousness of this "fantasy land" that turns out to be just as full of human flaws as any "real" place in this world. The movie is such a fun diversion: a reminder that our dreams - and the people that populate them - aren't always what they seem, and yet a "happily ever after" can be found in unexpected ways when we embrace what's real. The actors really do a brilliant job, and each time I watch the movie I can't help but laugh, chuckle, and smile my way through Jane's misfortunes, mishaps, and mayhem. There's so much silliness and hilarious drama, yet it refrains from becoming too much to handle by lacing in Jane's genuine (and very relatable) emotions. Yes, I will confess that the fact that JJ Feild plays a big role in the film makes me happy... (He won me over as Henry Tilney in Northanger Abbey. 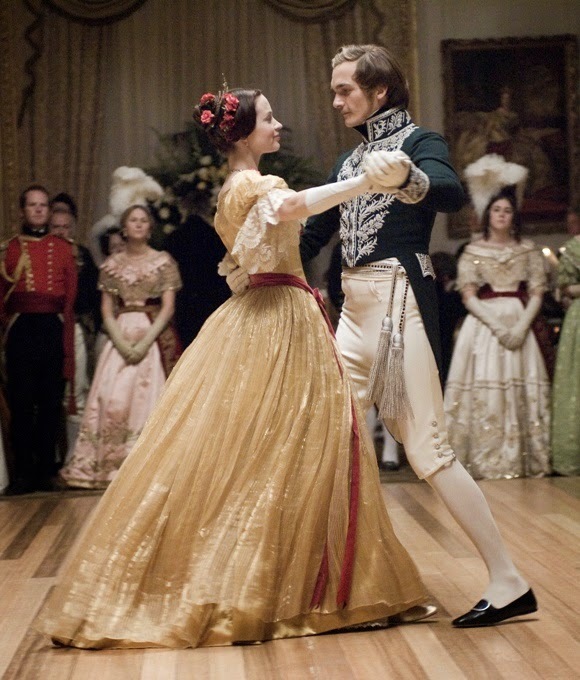 ♥) And the ending (especially the one for Austenland itself) is just too perfect! 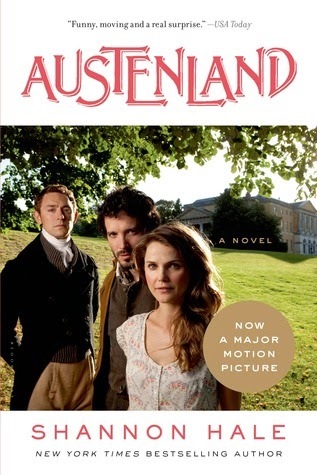 With how much I've been enjoying the movie lately, I couldn't resist picking up a Kindle copy of Austenland with its sale price. I was happily surprised to see that the book starts out quite different than the movie. And as the story progressed, I discovered a fun balance between "new" material and similar elements from the movie. As a blogging friend and I were chatting about on Twitter (S/O to @flowersquiet! ), the spirit of the book and movie are pretty much the same. I confess that I preferred Movie Jane to Book Jane, though. Book Jane felt more self-centered and more free with her affections than Movie Jane, but perhaps that might have been partly due to reading the whole story from only her perspective (and getting much more of her back story). That's another thing the movie allows for that the book does not: a broader glimpse at the other characters, which I quite enjoyed. One thing I loved more about the book: the heroine's "self-discovery," if you will. I loved that the hero encouraged her to pursue a long-neglected passion, and I loved that the pursuit of that skill started to take over her pursuit of the men at Austenland. That element of the story, and what it said about both the hero and heroine, made me happy. What about you? Movie or book? Thoughts on either...? A new season is about to begin in my life - one that might make me a bit scarcer in my usual corner of the blogosphere, and one that signals the end to Editing Through the Seasons (my freelance editing & publicity business). I'll still be around, though - just in a different capacity, which I couldn't be more excited about! I currently feel like I'm at a crossroads, where a huge dream lies just beyond my grasp, and the alternative scares me because it feels "less" and unimportant and monotonous. I'm afraid to hope - to open myself up to being badly crushed. And I'm afraid not to hope - to face new seasons of fire and waiting without knowing when they might end. I have no idea if this next step is going to be a time of glorious blooming or a time of continued preparation. Perhaps I shouldn't make those two ideas mutually exclusive, though. Because, as the last few very enjoyable lupine outings have reminded me, the number of the blooms (or lack thereof) couldn't take away the joy of the experience unless I let it. My mom and I were unexpectedly blessed this year with the purple carpets we had so longed to see. I'm grateful for the reminder that trials that bring growth eventually bring rewards. And I'm thankful for the fact that God is merciful and loving, blessing us in all sorts of ways - even in something so "small" as a day among the lupines. Starting this July, I'll be the new content writer in the marketing department at Harvest House Publishers! My mom and I were very kindly given the grand tour this past Monday, so we had the opportunity to see the lunch room (with such a beautiful view! ), the marketing team's section (everyone was so incredibly nice and fun, and the area is open, fostering an atmosphere of cooperation and camaraderie), the warehouse (oh, you guys! It goes on forever and smells of books! ), and the various other departments (yes, the editorial section is rather large!). The property and the building are simply stunning, and everyone I met made me feel welcome and at home. Interestingly enough, Harvest House's new blog is titled "Welcome Home" - and that's exactly the message I got when I arrived there. I really feel like Harvest House and its little corner of Oregon could be my new home. So, what does this all mean for my readers? As far as I know right now, I plan to continue self-publishing on the side. For certain, I've got to get Morning Glory out there to complete "The Heart's Spring" series! And I do have some other little ideas I hope to pursue. However, the majority of my focus needs to be on this new job, of course, so it might be a while between publication dates, and I'm sure my stories will continue to stay on the short side, as that's just how I roll. ;) And in all honesty, the fact that I'll be writing in this new position comforts me, so that even if I had to set aside my books, I'd still be doing something that involves the written word. :) We'll see how it all works out in time! For now, you can follow The Heart's Spring blog for any little publishing updates, and I do hope to create a new blog (which will link to that one) to encompass any new stories in different genres. Editing Through the Seasons will be soon be shutting its doors. I'll probably still run blog tours for my own books and possibly some for my cover designer, but for the most part, I really feel like I need to simplify so that the majority of my focus can be on my new job. I've had an absolute blast with this business, and I know that my experiences with my clients helped prepare me for this career path. I'm so grateful for each and every author who entrusted me with editing and/or marketing their stories, and for every blogger who joined me in those marketing endeavors. You helped prepare me for this new season, and words can't express how much your support has meant to me. While I do plan on cutting back a bit on some of my online endeavors, I hope to maintain Seasons of Humility. I might review less, in time (though you all know I probably won't be able to stop reviewing cold turkey, haha! ), and there won't be as many blog tours and the like. But I'm sure I'll still be talking books here, and now I'll have plenty of new material for blog posts as I embark on this journey of relocating to Oregon and working for a traditional publisher. :) I hope you'll enjoy being a part of it all! God is so good to guide us in His perfect timing to the places we need to be and into the passions He's placed on our hearts. When I graduated from college, I didn't have some grand plan - all I knew was that I thought I should go home, but I was scared to feel so aimless. I just had to trust that God would lead me one step at a time. And ever so slowly but sweetly, He took my hand and led me to this place: through starting my own business, to finally getting clients, to self-publishing my own books, to expanding the business to include publicity projects... Now, two years later, the direction makes perfect sense, and those times of uncertainty have blossomed into complete satisfaction and purpose. I couldn't have imagined how wonderfully, how beautifully, God would bless me with the desires of my heart. ♥ No matter what comes in the days ahead, just reaching this point has been a glorious gift. Dear friends, may you rest in the hope and joy of knowing God has a plan for your life, and He will guide you Home in His perfect way and timing. Blessings to you all in this season! Welcome to Seasons of Humility's stop along The Seahorse Legacy blog tour! It's my absolute pleasure to feature the third book in the "Eyes of E'veria" series today (you can read my reviews of Books 1 and 2 HERE and HERE, respectively). Let's start with my thoughts on the book, shall we? As Keeper of the Seahorse Legacy, Cazien de Pollis is a King among pirates, divinely appointed to dispense justice on the seas. Bound by the sacred oath of a long-dead ancestor, he must fulfill a contract to wed the green-eyed Oracle’s Daughter named therein — or risk losing everything he and his people hold dear. But at nineteen, with the identity of his betrothed only recently revealed, Cazien resents the contract — and the urgency within him to see it satisfied. Subtly paying homage to several classic tales including Peter Pan, Robin Hood, The Little Mermaid, Much Ado About Nothing, and even The Three Little Bears, THE SEAHORSE LEGACY begins an epic re-imagining of the classic Grimm fairy tale, The Twelve Dancing Princesses, which will conclude in Eyes of E’veria, Book 4: THE SUNKEN REALM. Dark. Daring. Delightful! 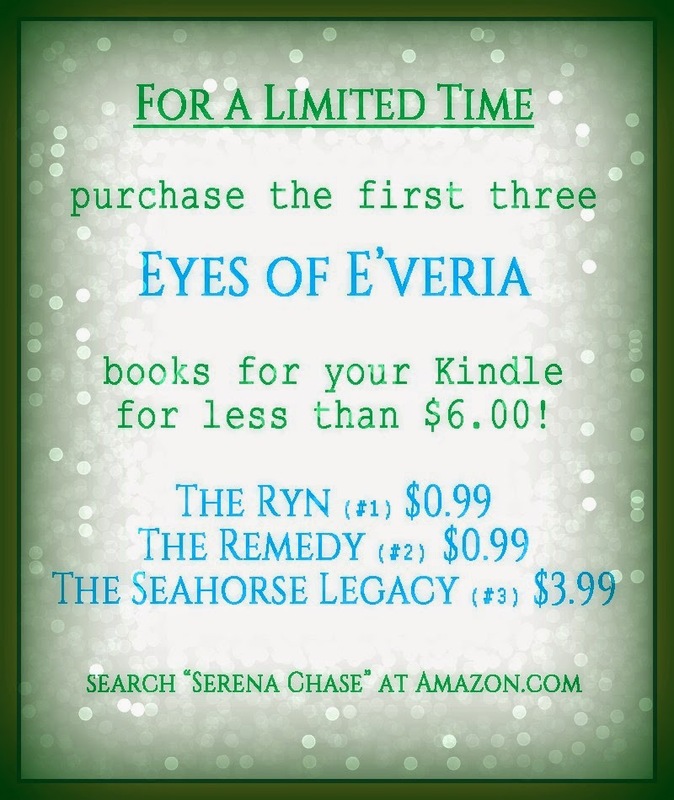 The Seahorse Legacy was everything I could have hoped for as a third installment in the "Eyes of E'veria" series and as the start of a new set within the series as a whole. Yes, I'm seriously desperate for the fourth installment (The Sunken Realm, releasing in 2015) - as there's a lot that still needs to be resolved. Yet, despite the setup (i.e. 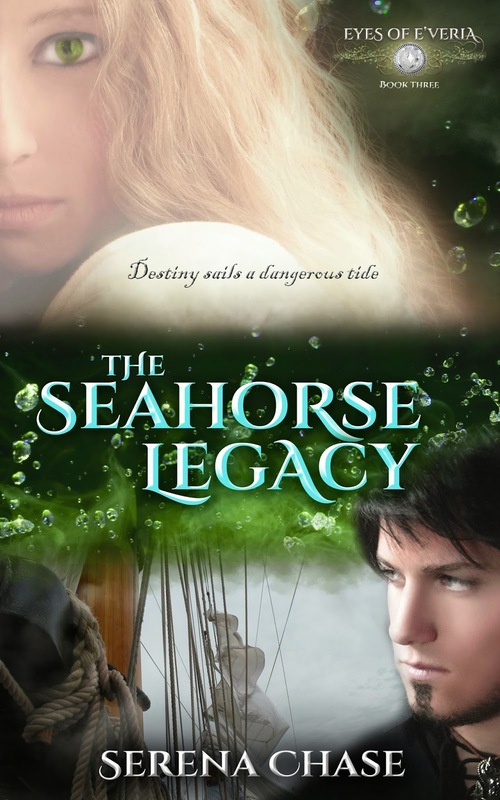 : background information) and the time the hero and heroine spend apart, I still found The Seahorse Legacy to be full of adventure and romance. While it doesn't necessarily stand alone, it's still satisfying enough on its own to warrant reading it now, even considering the wait for Book 4! Erielle and Cazien are seriously an explosive pair. They each have their own dreams and duties - and a streak of independence as sharp as a dagger. Their story together is only just beginning, but the stories of their individual journeys of humility, obedience, and faith are quite powerful here. The scenes that brought me to tears were the ones where I could feel Erielle's embarrassment and devastation, so heartbreakingly authentic even as the pain is being used to bring her to the place where she needs to be. Although there is quite a bit of time apart for these two, their chemistry sings when they're together. (Sometimes in a loud, rock-'n-roll sort of way, and sometimes in a boy-band love-song sort of way. *wink*) The anticipatory suspense between their "together" scenes made the Kindle pages fly for me. I wanted to see when they would meet up again, what would come of each new interaction, and when Cazien would finally come clean with Erielle! We've got pirates (which means there are some rather violent scenes, just as a heads up); we've got danger and deception, a mystery, and a hero and heroine with a heart for others; and we've got a wild and intense ending that serves as a semi-pseudo HEA that's both touching and agonizing (keeping in mind the wait for The Sunken Realm). In other words, we've got another wonderful fantasy romance from Serena Chase! And now for a fun interview with the author! Amber: The “Eyes of E’veria” series continues! Wonderful to have you here to chat with us about it, Serena. :) Tell us, what can readers expect in this new season of the series? The first 2-book set in the series was told through Rynnaia’s point of view, but this latest installment features dual protagonist point of views, both of whom we met as minor characters in the first two books: reader-favorite Cazien de Pollis, a pirate, and Erielle de Gladiel, Julien’s sixteen year old sister. Both Cazien and Erielle can be quite charming when they want to be, but no one would accuse them of being “sweet.” Their particular brands of “charm” define and differentiate their dialogue, internal monologues, goals, and even the way they flirt and fight from that of their predecessors, Rynnaia and Julien. This is a faster-paced, much more violent story with a subtle, overall edginess that was not present in the first two books; an edginess one would tend to expect from a pirate hero like Cazien and a heroine such as Erielle, who defies convention. Amber: I love your descriptions of the differences between the first hero/heroine and this new pair. So true! And yes, this story definitely came across as more violent/edgy - but a heart-pounding, emotion-tugging way. Now, how does The Seahorse Legacy signal a new season for Erielle? Serena: Having her point of view front and center is fun. She’s pretty outspoken and all about the girl power. Her confident voice is very different from Rynnaia’s, and yet her youth is still apparent. At the end of The Remedy, Erielle had achieved her dearest-held dream, but in The Seahorse Legacy she discovers that getting what you want comes with its own set of challenges and disappointments. She has recently discovered a troubling connection to her ancestor, Lady Anya, (aka The Oracle Scribe) that goes beyond blood and into the realms of the supernatural, so she has a lot to figure out. She is privileged and stubborn, young and driven. Unfortunately, she also has a few entitlement issues and believes herself to be totally self-reliant. Erielle has not yet come to a place of brokenness from which she can grow, but it seems to be stalking her with great—and perhaps quite literal—intent. But let's talk pirates! 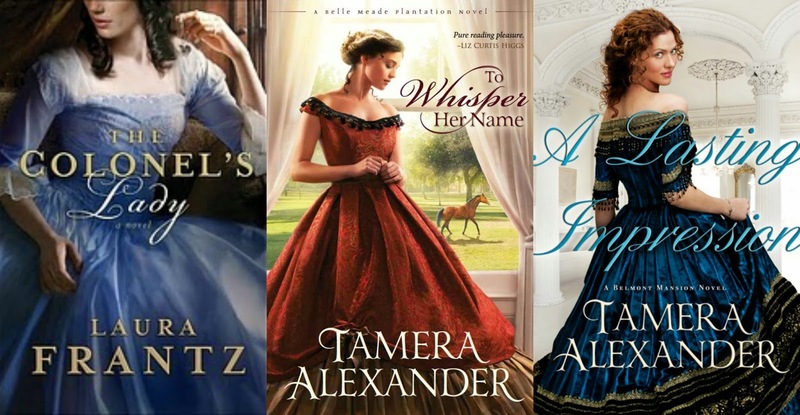 Do you have a favorite—fictional, historical, or otherwise? Serena: Other than Cazien? *laughs* I love my Cazien best! But if I had to pick a favorite fictional pirate not of my own creation, it would be a tie between The Dread Pirate Roberts (from The Princess Bride) and Captain Jack Sparrow (from Pirates of the Caribbean). I also adore Captain Shakespeare, as portrayed by Robert DeNiro in Stardust and Captain Killian “Hook” Jones is pretty much the only reason I’m still watching ABC’s Once Upon a Time. Pretty much any time a pirate becomes a hero, I’m in love. On the girl-power end of the spectrum, the true story of 16th century Irish pirate and chieftain Gráinne Ní Mháille (aka Grace O’Malley), as well as the fictionalized version of her life, as told in the short-lived Broadway musical The Pirate Queen, are both very entertaining and inspiring. Speaking of favorites, it must be asked... What is your favorite fairy tale, and what makes it stand out to you? Amber: LOL! Love it. What’s next on the publishing horizon for you? Will Cazien and Erielle make a return? Serena: Indeed they shall return! Caz & Erielle have much left to do and it will take a second book in this set to accomplish it! The Sunken Realm (Eyes of E’veria, book 4) is currently under construction and will release in 2015. 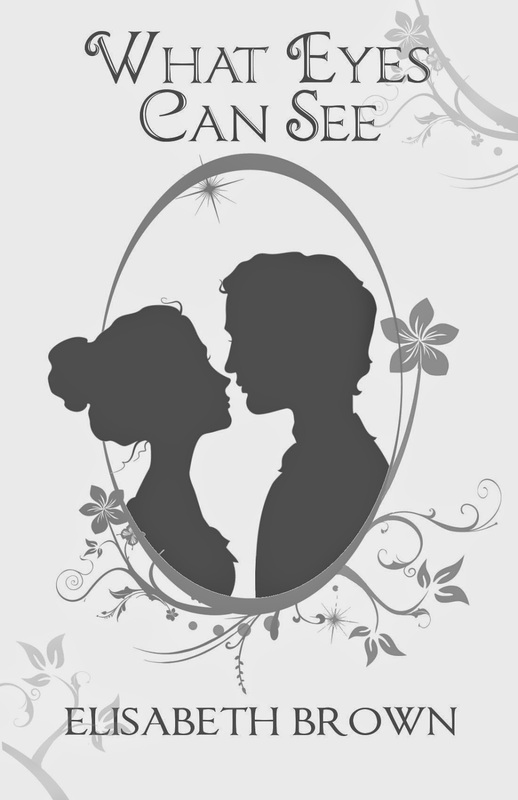 After that, I am taking a break from fairy tales and all-things-E’veria to finish the first draft of a paranormal novel that has a chick-lit/rom com vibe, and to put the finishing touches on a contemporary YA inspy romance that is almost ready to send out the door. I love E’veria and fantasy and expect to come back to it someday, but I am looking forward to letting my snarky, sarcastic side off the chain in that paranormal! Thanks to Serena's generosity, we have two giveaways today! This first giveaway is specifically for Seasons of Humility readers, so enter away, dear friends! And this second giveaway is a tour-wide drawing for paperbacks of the series!